In October 2015, Ashesh (dressed as Waldo) proposed to Divya (dressed as a scarecrow) on Halloween! “He totally surprised me - I had no idea Waldo was about to get down on one knee and propose to me! I love Halloween so it was the perfect proposal and Halloween will always be a special day for us.” Scroll below for more sweet wedding details from Maharani Divya! 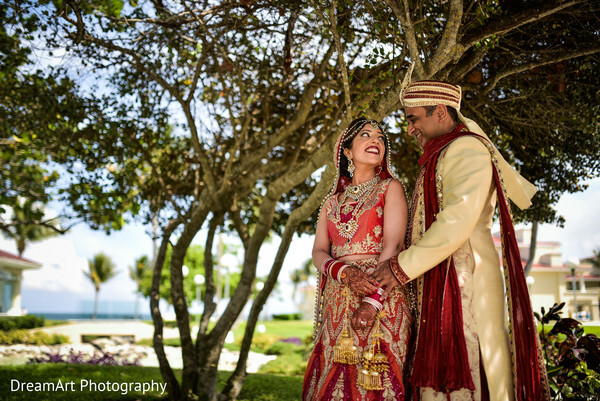 The newly engaged couple knew they wanted to have a destination wedding, and decided that the Moon Palace in Cancun, Mexico would be the perfect place. The venue turned out to be a fun-filled locale, containing over 14 restaurants and plenty of activities for guests! 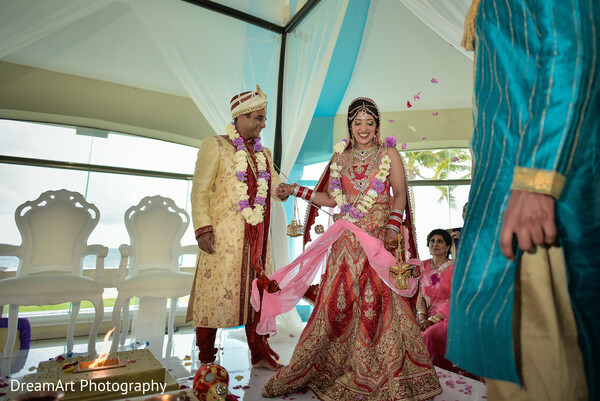 The ultimate travel concierge services were provided by Indian Destination Weddings, and from beginning to end, the wedding events were an absolute blast! The very first event was a welcome fiesta. It took place on the beach, and Zuniga Productions decorated the space with paper lanterns and tiki torches to give the natural surrounding a festive touch! The creative couple hired a mariachi band and Moon Palace served Mexican appetizers. The second night in Mexico was the sangeet/mehndi, which had an orange and pink theme and Thai food from Moon Palace. 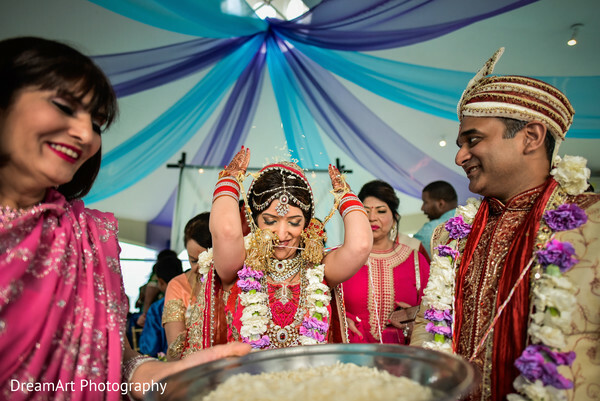 While guests had mehndi applied, several dances were performed by family and friends, which the couple enjoyed so much! The next event was the ceremony, in which Divya looked radiant in a richly embroidered pink and red lehenga and a lovely, tiered maang tikka! 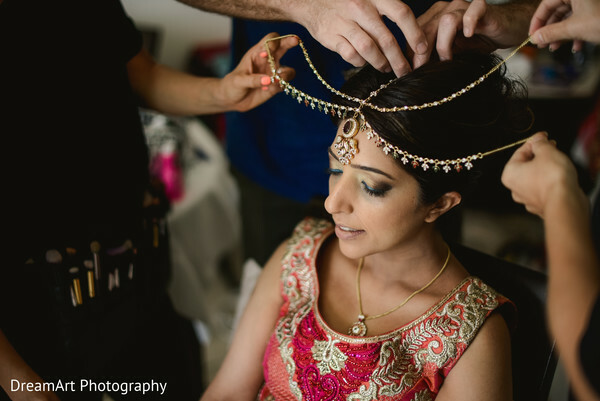 She had beautiful hair and makeup applied by Styling Trio, with intricate henna by Mehndi by Veronica. The emotional ceremony went off without a hitch and couldn't have been more beautiful! Join us later today to read about the couple's incredible beach reception and check out the full gallery by DreamArt Photography while you wait! Towards the end of October 2015, Ashesh and I were both really busy and hadn't seen each other for a few days. He had taken a trip to Boston and when he got back we had plans to go out on Halloween night to a couple of parties. When he picked me up, we were both in our Halloween costumes. I was a scarecrow and he was Waldo. He said he bought a gift for me in Boston...then he handed me a huge bag and I wondered what it was! Well, it was some chocolate...and a ring! He totally surprised me - I really thought he was just going to give me a souvenir from Boston. I had no idea Waldo was about to get down on one knee and propose to me! I love Halloween so it was the perfect proposal and Halloween will always be a special day for us :). I never would have guessed that I'd be proposed to by a guy dressed up as Waldo! We had a wonderful travel agent, Ateet Ahuja, who was a big help as we decided on a location in Cancun. We knew nothing about destination weddings but I knew I wanted a beach wedding. Ashesh and I went on a scouting trip to Cancun with our parents to check out a few resorts. When we got back we talked to Ateet about the places we saw, but ended up choosing a location Ateet recommended that we hadn't had a chance to see on our scouting trip. He took the time to really describe the resort to us and our parents and it sounded exactly like what we were looking for. Once we decided on the venue, the hotel provided a wedding coordinator to us. She told us about all the preferred vendors the hotel had. We ended up going with the preferred vendors for everything except the DJ. I was really nervous going with vendors that we had never met before, and most of our communication with the vendors in Mexico was through email. But everything turned out amazing in the end! We arrived in Mexico two days before our guests arrived. As soon as we got to the resort we were greeted by our on-site wedding coordinator, and had a five hour meeting with her to go over every detail of our wedding weekend. It was a long meeting and we were all tired by the end but I felt soooooo much better (and so did our parents) because we knew everything was falling into place. I loved all of our vendors in Cancun. I have my mehndi done in Mexico. I showed her a design I liked and she did a great job of recreating the same design. The same woman, and someone she brought with her, also did mehndi for our guests at the Sangeet/Mehndi. The Hair & Makeup vendor was AMAZING! They even helped me with my outfit...they do a lot of Indian weddings in Mexico so they knew exactly how to cover my head and everything. My mom was so impressed! The vendor that did the decorations was also great. We had a lot of choices so one of the hardest parts was deciding on décor for each event. The colors for the wedding were blue and purple. Purple is my favorite color and I love the way the combination looks. The blue bridesmaids outfits looked really nice on the beach! Our wedding wasn't right on the beach...but it was in a gazebo overlooking the beach so you could see the beach in the background. My parents actually went to India and did all my wedding shopping! 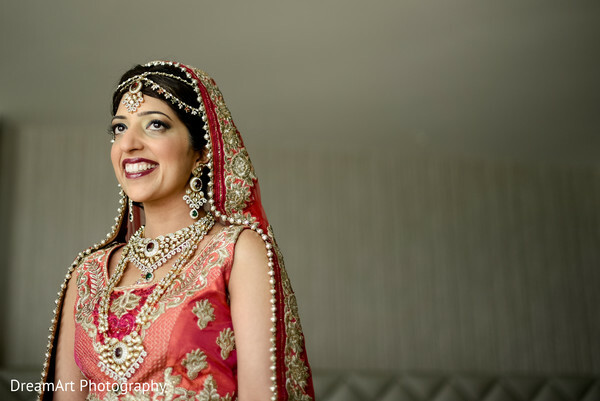 I was a little nervous about not picking out my wedding outfit myself but I couldn't take time off to go to India and didn't see anything I really loved when I took a trip to New Jersey. I gave my parents an idea of what I was looking for. I had told them I wanted red but my mom convinced me to be open to other colors. 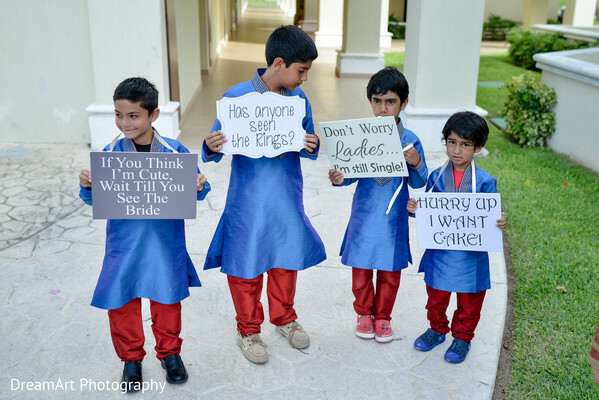 When they were in India, they ended up sending me pictures of three wedding lenghas they liked and thought I would like too. I picked the one I liked the best and when I saw it in person I loved it! They did such a great job picking out the perfect wedding outfit for me! I had a great time planning the wedding with my husband. I love planning events so I knew I was going to have fun with it, but I was surprised that Ashesh wanted to be part of the whole planning process too! We had fun with planning even though it was stressful at times, mostly because we couldn't meet with our vendors in person and never even saw the resort until we got to Mexico. Ashesh may not have cared about all the details as much as I did, but we still planned everything together. It was a fun project to work on together...we saw that we actually had a lot of the same thoughts, likes and dislikes so it was easy to come to many of the decisions. 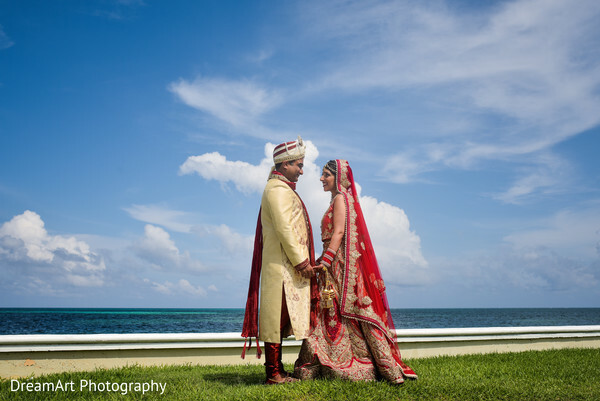 I think our guests had a great time because we had a destination wedding in Cancun so it was a vacation for them. Most people stayed at the resort for three nights. We had events every evening but during the day they went to the pool, beach, etc. so they had fun being on vacation together. It was a great opportunity for our family and friends to get to know each other! A lot of guests told us it was so much fun that our entire group got to spend a few days together. We had three nights of events in Cancun. The first night was a welcome fiesta, which was right on the beach, and we went with really simple decorations (paper lanterns and tiki torches). We hired a mariachi band and served Mexican appetizers so that our guests could go eat dinner at one of the resorts many restaurants either before or after our welcome party. The second night was the Sangeet/Mehndi, and we went with a colorful theme of orange and pink. This event was outdoors on a terrace near one of the pools. There was a tent that the mehndi ladies sat under. After women got their mehndi, several of our family and friends performed dances. There was even a surprise performance which all of our relatives got involved in! We had so much fun at this event! The food theme for that night was Thai. We had a photo booth at the reception, which was a lot of fun. We got a book at the end that had all the pics that people had taken, and they wrote messages for us in the book as well. We loved seeing all the pics the next day! Also, instead of a guestbook, we asked our guests to write a message on a piece of paper for us to read on our first anniversary. I can't wait to read all the messages a year later! Enjoy the planning process and relax!! Even though it can be a stressful time, it's going to be over before you know it so have fun with it! The venue was so nice. For anyone thinking about getting married in Cancun, I really recommend it because it's a huge resort with a lot to do. You don't have to worry about your guests not having anything to do. Also I think there are about 14 restaurants so when you're not hosting an event, they will have plenty of options for food. My sister-in-law made the bridesmaids bouquets! We didn't see the point in getting real flowers which the bridesmaids wouldn't be allowed to bring back to the US, so my sis-in-law made some beautiful fake bouquets for them. The dhol player from Mexico was really good and got everyone to dance a lot during the baraat! We bought the wedding favors (a beach bag personalized with our names on it filled with a few items guests might need during the weekend, like advil, pepto, stain remover, hand sanitizer, etc. ), as well as the programs for the ceremony online. I recommend spending a lot of time on Etsy and Pinterest if you're planning a wedding! Make sure to check back soon Maharanis! 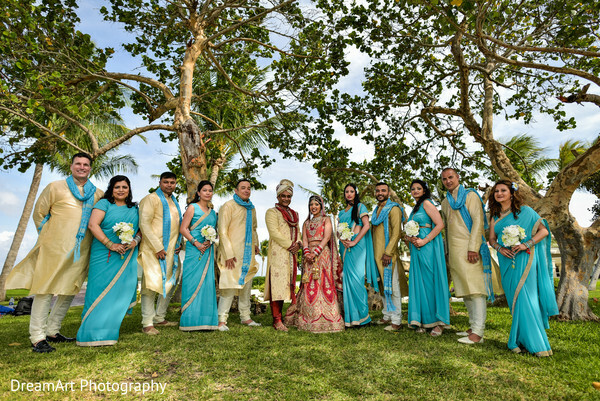 You don't want to miss Divya & Ashesh's reception details!